A female suicide bomber has attacked a police station in a historic area of Istanbul, leaving one officer dead and one injured. The woman reportedly spoke English when attempting to enter a police building in Istanbul’s tourist-heavy Sultanahmet district. Her nationality and identity were not immediately established, Istanbul governor Vasip Sahin told reporters. According to the Hurriyet Daily, the niqab-clad woman said that she had left her wallet in the building as a pretext for getting inside. The attacker "exploded herself prematurely before going into the police building, as she was prevented by the guards at the entrance," according to Cihan news agency. Sahin said two police officers were injured, one of them seriously. Media reports later stated that one of them died from his injures. 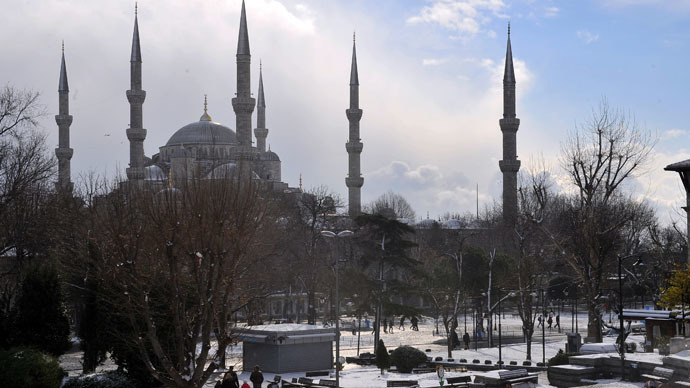 Police have sealed off streets in the vicinity of the attack and public transportation has been suspended in the area known for its historic landmarks like Hagia Sofia and the Blue Mosque. Turkish Prime Minister Ahmet Davutoglu has said that authorities are investigating any links to particular groups and terrorist organizations. "The authorities are investigating whether there is a link to any group ... We have given instructions for the most comprehensive investigations," Prime Minister Davutoglu told reporters in Ankara. The attack comes days after Turkish far-left group DHKP-C claimed responsibility for an attempted grenade attack on a police booth near the prime minister’s office in Istanbul. According to police, the grenade did not explode, but the suspect attempted to shoot at police officers with both a gun and a long-barreled weapon. The suspect was detained last Thursday. DHKP-C is a Marxist-Leninist secular terrorist organization responsible for numerous assassinations and suicide bombings.